Celebrate the North American debut of Radisson Blu with the opening of the Radisson Blu Aqua Hotel, Chicago and earn triple AAdvantage miles on your next eligible stay at any Radisson hotel worldwide from October 15, 2011 through December 15, 2011. American Airlines AAdvantage members who provide their member number at the time of check-in can earn a total of 1,500 AAdvantage miles for each Eligible Stay during the Promotional Period. There is no maximum on the number of Eligible Stays that can qualify for the bonus during the Promotional Period. No double-dipping, it’s either Club Carlson points or AAdvantage Miles (not both), and to qualify for the miles you have to make your reservation through Radisson. You can go here for the full details of their Triple AAdvantage Miles offer. If you’re not familiar with Radisson Blu, it’s Radisson’s upmarket brand, with 158 hotels in Europe, Africa, and Asia. The new Chicago location is the first Radisson Blu hotel in the United States, and the building they selected, the Aqua, is one of the more interesting looking skyscrapers in a city that really takes its architecture seriously. You can see a photo tour of the hotel here. Every week through December 16, the Club Carlson Ultimate Getaway Giveaway Sweepstakes is giving away exciting vacation packages, including airfare and hotel accommodations. Business Class airfare for two, a five-night stay at any Carlson hotel worldwide and $10,000 cash for shopping. Coach Class airfare for two, a two-night stay at the new, upscale Radisson Blu Aqua Hotel, Chicago and $2,500 cash for shopping. To enter, you have to be a member of their Club Carlson loyalty program, if you’re not already a member you can sign up for free. Go here to enter the sweepstakes or to read the full terms and conditions. 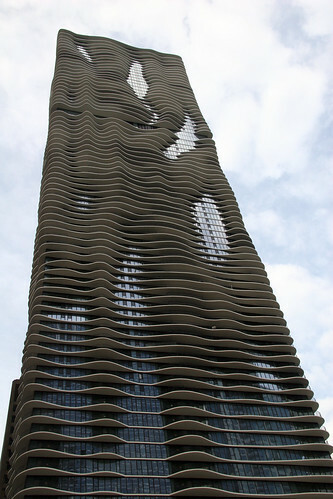 Photo credit: Aqua Tower 1 by Jeanne Gang on Flickr. Check out her whole set of Chicago photos for more of the Aqua building as well as some other very nicely photographed downtown sights. The hotel portion of the building is only the bottom 18 floors.